After arriving home from camp and settling in, I got on the computer to see what I had missed, and yes, I’ve missed a lot. All this confusion and crazy news rushing over me and into my jumbled head which just hours ago was worrying about saying goodbye to all of my friends at camp was a little much for me at first. Now that I have adjusted a little more I can sit down and write on my blog. I must say, it feels pretty good. From the day I left camp I had an idea related to my blog that stayed with me the entire time. Now I can carry it out. I thought some people might be interested in camp and how it was. Writing about stuff sometimes does help my summarize them in my mind and make them a little less confusing as well, so my hope was that I could make this entry informative for anyone who is curious about the latest month in my life, as well as therapeutic for me. As I said before, my mind is full to the top of stuff right now, so this should help. The idea I had was to think about away to connect my experience at camp to baseball. I kind of got this idea from Matt Peaslee in his blog, The Pittsburgh Peas. One of the last blog entries I read was his entry about his trip to the amusement park Kennywood. He connected this relatively unrelated day to baseball and sports in a pretty cool way (check it out to find out how). So I racked my memory of the last month for anything I could connect to baseball and I found a nice baseball story of my own I thought connected pretty well. While at camp baseball news is pretty distorted (as I said). I missed a good deal of trades, huge moments, up and down movement in the standings, etc. Often I found out about these things in strange and abnormal ways. For example, I first found out about Mark Buehrle’s perfect game around 4 or 5 days ago (almost 2 weeks after he threw it) and only then did I find out about it from a friend’s Sports Illustrated he had just received in the mail. This is mostly due to the lack of internet for campers (even staff only go on a few times per week) and the scarce-ness of radios to listen to games or even time to listen to them. From the minute I arrived I was busy all day everyday, and I barely had time to worry about baseball. Yeah, it’s maybe the one thing I follow the most in daily life, but yet I survived free of it for a month with literally no trouble at all. I didn’t even miss it too much until I heard the shattering news about David Ortiz becoming the latest on the list of convicted juicers. It was one of the only times at camp I truly wanted to be at home. I needed Red Sox Nation to comfort me as I knew they were to eachother at home. I needed the support on MLBlogs to help me keep my head up. I was at camp, where, even in Vermont, the number of serious Yankee fans outnumbers that of Red Sox fans. And even though I’ll call them serious for sake of explaining my dilemma, I do think that many of them were sort of boneheads when the Ortiz news came to us. They gave us few Sox fans hell for a few days, popping up all over the place and insulting Ortiz, laughing at us in what I thought was only relief over the fact that: “Haha, now the Red Sox have a juicer too, they can’t make fun of us anymore!”) Okay, this might be true, but let’s be honest, a lot of you Yankee fans didn’t like A-Rod that much anyway. The Ortiz news was extremely devastating to me. I sat at dinner for 10 minutes without saying a word. Even the one guy that we kept denying could have ever taken steroids had been on them. It was the final blow for me. I now fully understood that no fan could be safe from the crushing facts that any player these days could be on steroids. Sure, Big Papi went from no one to the best clutch player in Sox history in ’04, kept playing better than ever. And then this season there was the huge slump, and words of steroids once again rose to the surface of the baseball world. Papi must have suddenly gone off the juice and that was why he was struggling so much this season. But no, we said, many of us still had faith even when that doubt was still in the back of our minds. We believed that the loveable face of our team wasn’t in the same class as big league jerks like A-Rod, Bonds, etc. He was better than that. But in the end, was he really? I was having trouble figuring that out while at camp. I needed to find solace somewhere to clear my mind while I wondered if I could even respect one of my favorite players anymore, if I could call my power hitter best friend Big Papi whenever he batted for our Little League team anymore. As I was flipping through a Sports Illustrated that I had brought to camp, I found an article on Albert Pujols. Earlier this year he had been featured on the cover of SI in an article about how he assures you he isn’t on any PEDs and that touted him as one of the few clean superstars left. I suddenly realized that I had an idol to turn to, someone that could even rid me of a little bit of the troubling news about David Ortiz. 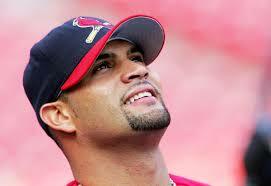 Pujols was my man. That day I put up a page from that magazine on the wall above my bed. I didn’t look at it all that much, but in some little way, it helped me get over the Ortiz news and realize that there are some good guys still out there. I don’t think Pujols will ever replace Ortiz in my mind in the way Papi did and I hope still can in the future, but for the time being, rooting for him is helping. I only wish I could have heard the news in the comfort of my home with friends to help me through some news that really saddened me. I don’t have much more to say on the story, but I hope you can take something away from my heartwarming little story from camp. I hope I did an OK job connecting baseball to camp so that you could learn a little about my experiences there. It was a great time, but I’m glad to be back. Thanks as usual for reading.